Combine all the Kosher salt, granulated sugar, water, apple juice, wildflower honey and the Sweet Mesquite Rub in a 5-gallon pot or a 3-gallon plastic tub. Stir the liquid until the salt and sugar dissolve. Immerse the turkey breast and weight down into the brine mixture. Cover and refrigerate for 12 hour. Pre-heat the oven to 325º Fahrenheit/165º degrees Celsius. Remove the turkey from the Brine*, drain, and discard the Brine. Place the turkey on a baking pan. Lightly brush the turkey with Canola oil. Sprinkle the breast evenly with the Sweet Mesquite Rub. Place the turkey into a roasting pan with the left side of the breast down for 30 minutes. Ease the bird over to the right side of the breast and roast for an additional 30 minutes. Remove the roasting pan from the oven and place it on the counter. Using a carving fork, turn the turkey in the pan so the breast is upright. Re-brush the breast and legs with Canola oil. 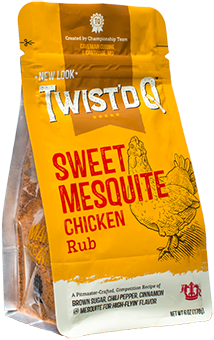 Sprinkle some additional Sweet Mesquite Rub over any bare spots. Return the turkey to the oven. Continue to roast, checking the temperature with a meat thermometer at regular intervals and brushing lightly with Canola oil to baste. If the turkey starts to get too dark, tent it with aluminum foil. When the center of the turkey breast reaches 155º degrees Fahrenheit/65º degrees Celsius remove the turkey from the oven and set it on the counter to halt the roasting process– it will continue to cook as it rests and should reach your final temperature goal of 160º degrees Fahrenheit/70º degrees Celsius within the next 15 to 20 minutes. 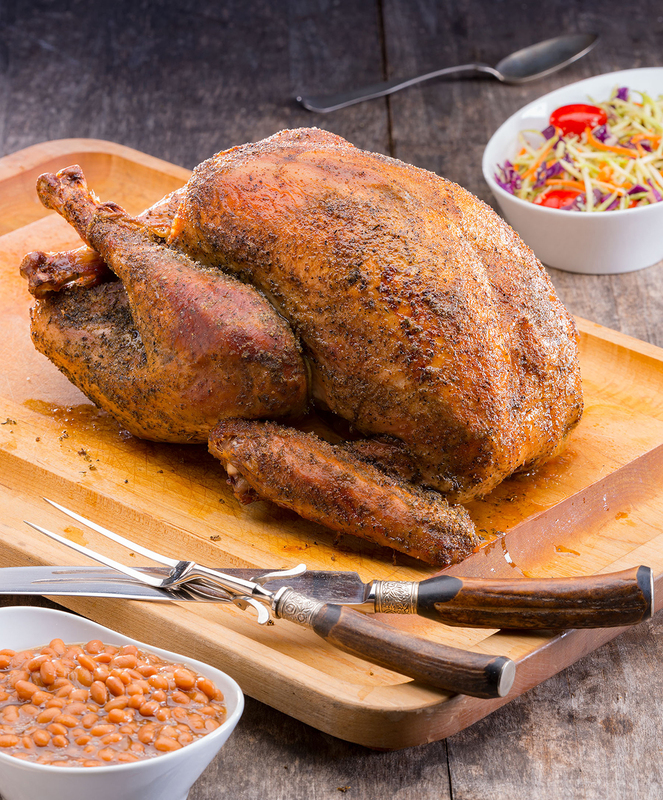 Transfer the turkey to a cutting board and carve. 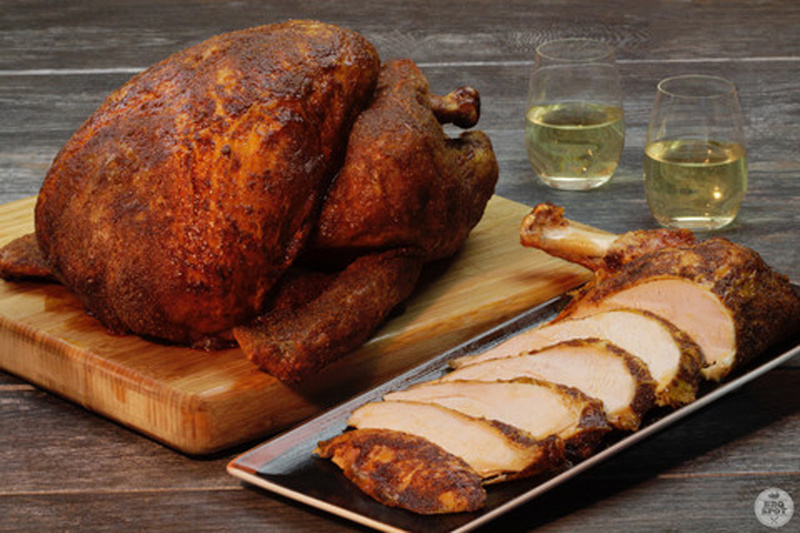 If you are starting this recipe with a frozen turkey, you will need to thaw it for 24 hours per 5 pounds of bird before immersing it in the brine. 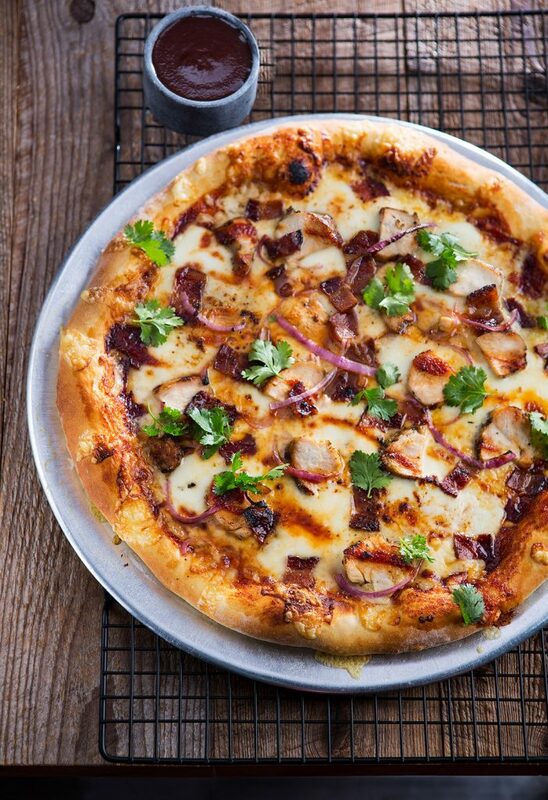 For a conventional oven calculate an average of 20 minutes of roasting time per pound of meat and measure the temperature by inserting the meat thermometer into the center of the breast, stopping at the deepest point. For a convection oven, the required cooking time will be less and will also depend on whether the oven is a commercial style or domestic. Cooking to internal temperature vs. time measurement and use a meat thermometer to determine the actual internal temperature is the preferred method for both convection and regular ovens. You can also cook the turkey for a longer period of time at a lower temperature after step 6, by reducing the oven temperature to 275º degrees Fahrenheit/135º degrees Celsius. It will take the turkey longer to reach the optimum internal temperature, but it will yield a lighter golden crust and help retain more moisture and maintain tenderness.